With Orthokeratology Refractive Therapy, vision can be improved to 20/20 without the need to rely on glasses during the daytime. The treatment is generally applied at night using a pair of retainer contact lenses. This allows the eyes to be reshaped non-surgically when they sleep. IGARD provides a ONE month trial to both children and adults who are keen on this intervention modality. That gives ample time before they commit on their journey in maintaining clear vision without glasses and in myopia control. Myopia Control with Orthokeratology is not new. Clinicians worldwide have long noticed that many adolescent children need not change their lenses during orthokeratology refractive therapy. But it is only until 2002 when researchers confirmed that this therapy reduces Peripheral Retinal Hyperopic Defocus and hence the retardation of the progression of Myopia. In general, the myopic prolate-shaped eye is reshaped until the cornea becomes more oblate in shape. A two-year longitudinal pilot study (Longitudinal Orthokeratology Research in Children / LORIC) in 2005 concluded that Orthokeratology Refractive Therapy could both correct and control childhood myopia, and a further two-year study confirmed that the eye growth has slowed down at least after one and two years of treatment (Corneal Reshaping and Yearly Observation of Myopia / CRAYON). What about ordinary contact lenses? 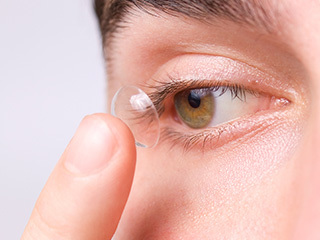 Ordinary contact lenses do not offer myopia control. However, multifocal contact lenses may be used. They are available in ‘soft’ material to children who suffers from progressive myopia. This strategy is most suited to a select group of children who have co-existing conditions that contribute to their eyestrain, such as increased levels of accommodative lag, high ocular accommodative convergence and near esophoria. It is also understood that there is a possibility that multifocal contact lenses can reduce Peripheral Retinal Hyperopic Defocus. Research involving identical twins showed myopia progression reducing in the twin wearing multifocal contact lenses compared to the twin who is only wearing ordinary soft contact lenses. Many patients with vision problems heartily embrace the idea of enjoying vision correction without having to wear eyeglasses or contact lenses. Not all of these patients, however, are good candidates for PRK or Lasik surgery, the two standard surgeries used to alter the way the cornea of the eye refracts light. If that describes you, don't fret -- because here at IGARD, we offer an advanced corneal reshaping technique known as orthokeratology, or Ortho-K. This non-surgical technique can produce changes to the way your cornea refracts light. Some of our patients simply don't like the idea of any kind of surgery, or they want a reversible procedure. Orthokeratology may be an ideal choice for these individuals. 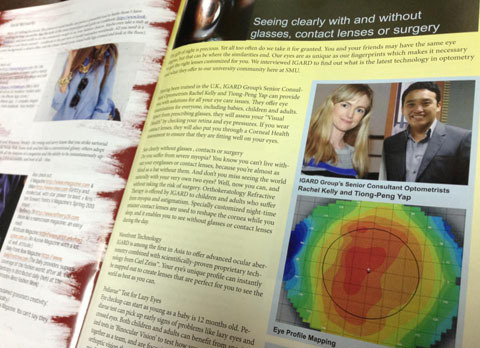 The team in Singapore will map the shape of your corneas precisely and then fabricate special contact lenses. Unlike standard contacts, you'll wear these lenses at night. The lenses perform a subtle corneal reshaping as you sleep, meaning that you can take them out the next morning and enjoy perfect or near-perfect vision.